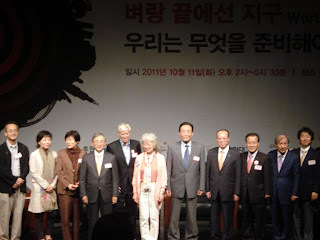 October 11, 2011, I along with others MAINS students at Sungkonghoe University had the chance to participate in “The 3rd Year Anniversary: International Symposium” on climate change and global warming impacts in the world organized by Climate Change Center at Ewha Women High School, Seoul. Brown, the founder of the Worldwatch Institute, and founder and president of the Earth Policy Institute, analyzed the impact of global warming, food shortages, water depletion and energy shortages. At the end of his speech, he also urged the government and individuals to take action that interests them. The talk was followed by comments from the stage and floor. He highlighted that the extreme weather is having the affect of causing food scarcity in the future. According to Brown, food scarcity will result from four reasons. 1. Overpopulation: The present annual population growth is 80 million people. Tonight, there will be 219,000 additional mouths to feed at the dinner table, and many of them will be greeted with empty plates. Another 219,000 will join us tomorrow night. At some point, this relentless growth begins to tax both the skills of farmers and the limits of the earth's land and water resources. Beyond population growth, there are now some 3 billion people moving up the food chain, eating greater quantities of grain-intensive livestock and poultry products. 2. Water Supply: The food shortage has also been affected by the supply problem. The large-scale uses of mechanical pumps are exploiting the underground water. Today, half the world's people live in countries where water tables are falling as a result of over pumping. But sooner or later, falling water tables translate into rising food prices. As a result, irrigated areas are shrinking in China, India and notably in the Middle East especially Saudi Arabia, Syria, Iraq, and Yemen. Over pumping may be a potential threat in the future although it will solve the current needs. 3. Climate Change: Another emerging trend that threatens food security is climate change which has directly affected the existing agriculture and overall temperature of the earth. Of particular concern is the melting of mountain glaciers in the Himalayas and on the Tibetan plateau. 4. Lack of New Technologies: The agricultural production is shrinking overall resulting from lack of modern technology. The UK, France and Germany stopped growing wheat because they had no new technologies. On the other hand, some countries like Japan increased their production with the help of technologies. Brown worried about the future and argued that “what we are doing today will not take us further” and urges everyone to follow the process below in order to sustain ourselves and our environment. 1. No trouble to anyone because wind energy scales up but does not scale down. 9. It can be brought online quickly. Jang Pil Hwa, the only female discussant on the stage, emphasized the impact of climate change on women. She highlighted the fact that women and children suffer far more than men from hunger, malnutrition and famine. Therefore, there is the need to incorporate women in environmental issues. One of the discussion members pointed out the need for public awareness so that individual efforts can also help to reduce at least 10% of carbon emission. The awareness should be the first priority of the state and its actors; however we should not wait for others. He argues that “most of the time we try to escape from issues saying that it’s not our responsibility” which I personally think is very relevant.